This is one of the best Breazy Sales we’ve seen in a while. 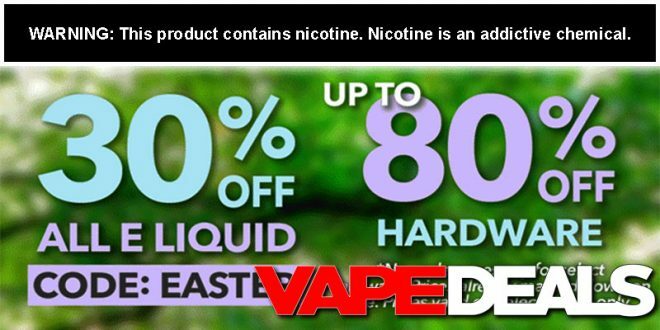 You can now get 30% off their entire selection of premium e-liquids when you apply coupon code “EASTER” at checkout. These guys tend to run a lot of sales on select flavors, but rarely do they offer a discount on everything. Take advantage of this one while you can. The coupon code officially expires Sunday (4/21) at 11:59pm EST. As usual, they’ll be running some special hardware deals too. No coupon code is needed for those, but you could get an extra 10% off (sitewide) with code “VAPE.DEALS10”, or 20% off Pod Systems with code “CLOSED20” (no stacking / one code per order). Breazy offers FREE shipping when you spend $50 or more.